World X is much like our earth except for its extreme daily temperature swings. Either one of these extremes (-10º F and 160º F) would kill most earth creatures, let alone both of the extremes in one day. Some animals however have found ways to thrive in these harsh conditions. 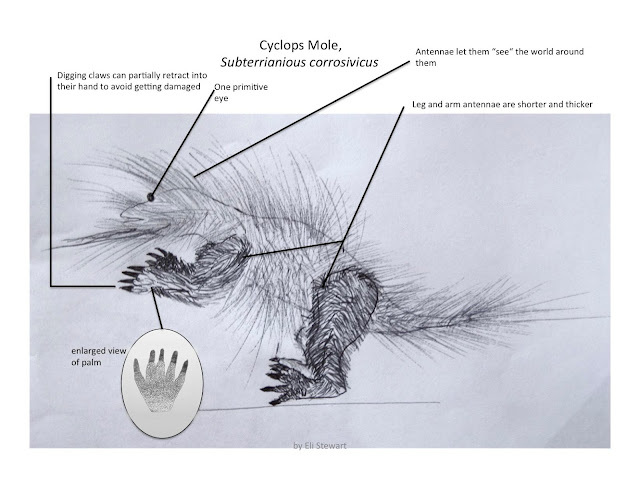 The creature best adapted to it’s harsh environment is Subterrianious corrosivicus, commonly known as a cyclops mole. The cyclops mole avoids the extreme temperatures by going under ground. It burrows through the soil on the surface of Planet X using its retractable shovel-like claws. When it reaches bedrock,it strokes the rock with its four-fingered hand. This action opens thousands of tiny acid glands, releasing a 1 mm thick layer of sticky acid on the rock thus the name, Subterrianious corrosivicus. After about 10 minutes, the acid has eaten away about 2 ft of rock. Over time, Subterrianious corrosivicus will create an extensive tunnel system. Since it is pitch black in these tunnels, it uses antennae (some are over 1 foot long) to paint a 360º picture of its surroundings. Becase Subterrianious corrosivicus only goes to the surface for short occasional trips to get water, it has no need for more than one primitive eye. Subterrianious corrosivicus would die if it weren’t for a small worm-like creature that lives in the trillions within the bedrock of Planet X. These little creatures called Bore Worms bore through the rock using small amounts of acid. When the cyclops mole corrodes the rock thousands of them are exposed. Subterrianious corrosivicus then licks the worms and and its own acid off the rock. The worms are then crushed against the roof of the cyclops mole’s mouth releasing their acid. The worms’ acid, along with its own, is absorbed by its large sponge-like tongue. This acid is concentrated in acid sacs in its wrists for later use. After their acid has been used, the worm’s crushed body is swallowed for food. Getting water on Planet X can be very tricky for the cyclops mole and other inhabitants of Planet X. During the night, all surface water is ice or snow which is impossible to drink and the temperature is below zero. As the sun rises, the ice melts and and evaporates (sometimes during the hotter parts of the year snow turns directly to vapor). By this point Planet X is completely covered in clouds that block out the sun. Because of this Planet X begins darkening cooling off creating night in the middle of the day. Then it starts to rain filling river beds, dry pond beds, and streams. Now all the creatures of Planet X including the cyclops mole come out of hiding to drink before night falls. Subterrianious corrosivicus can even store about a liter of water in its sponge-like tounge for later use. During the final hours of the day when Subterrianious corrosivicus and other animals come out to drink, others come out to feed. When water softens the soil of Planet X’s river beds a five inch long flounder like organism wiggles out of the softened soil in the hundreds. The schools of these flounders then swim down the river looking for prey such as a Cyclops Mole. When it finds its prey, the flounders latch onto it with their backward facing barbed hooks that cover their body. The flounder-like fish then begin eating into their prey. When the flounder-like fish eat their fill, the fertile females will lay their eggs in the quarry’s dying body. The body of the unfortunate creature will keep the eggs warm until the morning when the snow melts, upon which point the babies will hatch and burrow into soil of the river bed. The flounders often have trouble catching Cyclops Moles because their antennae can sense vibrations in the water from hundreds of feet away. Even if the fish do catch Subterrianious corrosivicus the antennae make it hard to find a place to grab on. Even though Planet X is a tough place to live, Subterrianious corrosivicus has found a way to survive by by burrowing underground using its acidic hands and shovel like claws to escape Planet X’s extreme temperatures. 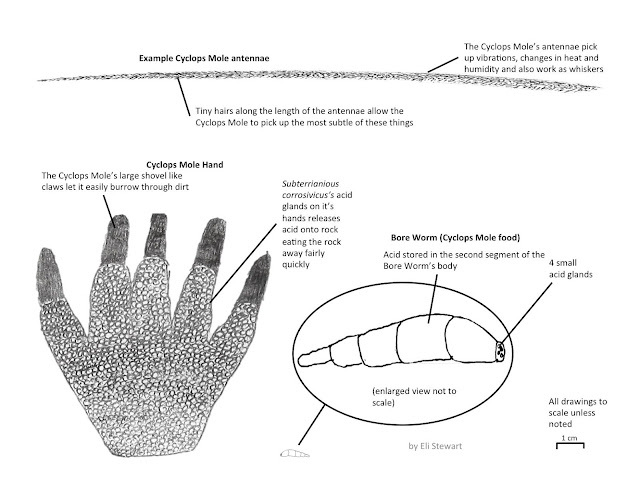 The cyclops mole is preyed on by a small fish and eats an even smaller worm that is crucial to its survival. "What a real E.T. might look like"